Time has flown by and all of a sudden my little squishy faced baby is now turning into a proper little boy, Harry is now 6 months old – this kid has been in our lives for half a year??!! We survived!! Yay!! Holy crap its been the most mental, hectic, stressful, exciting, emotional, happy, precious 6 months of our lives and I wouldn’t change a second of it!! Weight: H is solid. Not fat just solid!! He weighs a whopping 17lb 15! I’m not sure if hes really our child as Scott and I are such tiny people!! Daily: We have a pretty good routine going now (on a good day). Harry wakes around 7am for a bottle and breakfast, he naps at 9ish for 45 mins to an hour then we get him dressed and play until his next bottle at 11. He then goes down for a lunchtime nap at 12pm which can last up to 2 hours but we still don’t get this everday which is a real shame as he definitely needs the sleep, he is SO much happy when he takes the long nap! I give him lunch shortly after he wakes up and then another bottle at 3 – although I have missed this a few times now by accident and he hasn’t really moaned for it! He will usually have a cat nap about 4 to recharge his batteries and then we have tea at 5.30pm, bath at 6.30pm and bottle/bed by 7pm! PHEW! Writing it down makes it seem hard work! Harry is just starting to master sitting up which is SO much fun as he can see the world from a different view and play with his toys a lot easier! He really isn’t much of a fan of rolling around for some reason, but he does still love to lay on him tummy! 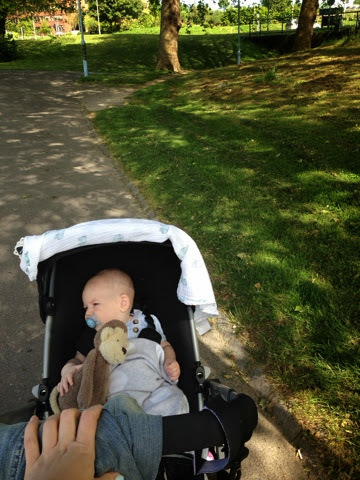 We try to get out the house with Haribo everyday so we can often be found strolling into town for a walk by late afternoon if its been a home day! I swear fresh air helps babies sleep better so I cant wait until our garden is finished and the weather is nicer so we can go out to play more! Its also a really great distraction from teething and other baby complaints he may have that day! 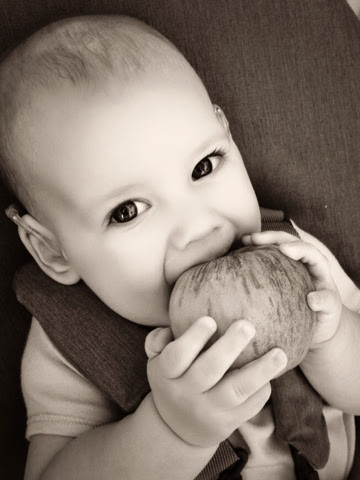 Eating: Turning 6 months is super exciting in terms of foods we can give Harry to try! I think he can pretty much have everything now apart from honey and nuts?! I spent a morning cooking this week to whip up his next dishes and bigger portions than before as well, using my Beaba Babycook – you can read more about that here! So far he has tried Annabel Karmel’s Lovely Lentils (he loved) and also her Chicken Casserole (he hated) and he is a huge mega fan of yoghurts! I want to start giving him a few finger foods but i’m scared for some reason!! I would love to hear any suggestions for the first finger foods to try him on!? Harry also still has 4 bottles a day usually taking 5oz in each, I am guessing we should drop one of these soon i’m just not sure which one!? Clothing: We are still wearing our 3-6 month clothing which is great as we don’t have a lot of 6-9 month gear, or much summer clothing come to think of it! We are off on holiday very soon so we will be picking up a few summery pieces going absolutely nuts baby shopping for that! He has prety much masteted eating purees and can tolerate a few lumps! He can just about put his dummy back in his mouth when he picks it up! Hearing: Its still the same old kicking up a fuss routine every morning when we put Harry’s magic ears in and as he is getting bigger and stronger it can be really difficult to “pin” him down and get them in! We had our first sign lesson last week and I really loved it! I learnt my alphabet pretty much straight away and I can’t wait for little H to do his first sign!! My guess is that it will be either “milk” or “more”!! As we have come to this big ol’ milestone of 6 months I just wanted to say thank you so much to all of my readers, some of you now great friends, for your following, support and love!!! You’re all FAB! I would love to hear about what your 6 month old is up to?! For first foods you could try slices of avocado or maybe steamed apple or sweet potato? Thanks for your suggestions I will give them a go!! I really enjoyed reading Harry's 6 months update. It's nice to read about someone who's a couple of months ahead of us. My son Myles is 4 months and I'm loving it. I'm actually really nervious to start feed as we're settled into a bit of a routine that suits us. I know I don't really have to start for another 2 months but it's still terrifying to me. Myles has started blowing reapberries too which I find hilarious! I know that has nothing to do with this post but I just wanted to share. haha.